As the last big mountain day, this stage could decide the entire race. Stage 17 of the 2008 Tour de France will be epic. And as the last big mountain day, this stage could decide the entire race. The stage will feature three huge climbs: Col du Galibier, Col de la Croix de Fer, and the finish up Alpe d’Huez. The riders will be tired after the gigantic stage the day before including the highest road in France – see here for a preview of Stage 16. And after another tough day, finishing up the legendary Alpe d’Huez promises a truly memorable stage. Below is an overview of the three big climbs. This will be the 31st time that Col du Galibier has been in the Tour – more than any other climb in the Alps – first appearing in 1947. The list of riders to be first over Galibier include such legends as Coppi, Gaul, Merckx, and Pantani. Rated Hors Categorie (hardest rating) the route will climb Galibier from the less interesting Briancon side. The first 28 kilometres is a long, easyish, straight drag passing through the Sierre Chevalier ski area. At the Col du Lautaret, the route makes a right-turn and gets much more interesting. The last 8.5 kilometres are beautiful. Don’t forget to look out for the monument to Henri Desgranges (see photo), the founder of The tour – nearing the top. In 1979 the route was raised above the tunnel by 90 metres and now literally goes over the mountain. 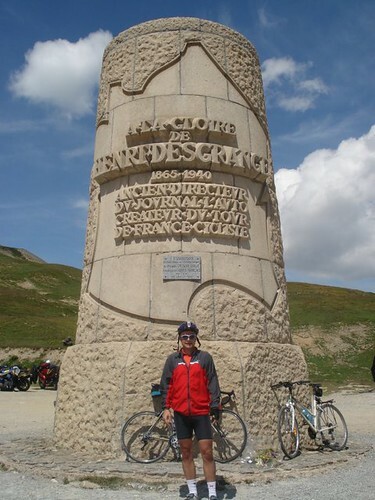 This will be the 15th time that Col de la Croix de Fer has been in the Tour – first appearing in 1947. This is another giant Hors categorie climb. The grade is constantly varying – there are even a couple of small descents. This climb might be the perfect place for an attack. Once at the top, it will be a thrilling 32 kilometre (20 miles) descent as riders catch their breath before the Alpe. Alpe d’Huez first appeared in 1952 – this will be the 26th visit – and was the first Tour de France stage to ever finish at altitude. Only Lance Armstrong and Fausto Coppi have won an Alpe d’Huez stage and gone onto win the Tour the same year. Sometimes called the highest place in the Netherlands – because so many Dutch riders have won here – each of the 21 hairpins are signed and named after a stage winner. It’s a lot shorter than the day’s other two climbs but from the beginning and throughout it is steep. Let’s hope it’s still close when the riders arrive. If you are planning on watching this stage on Alpe d’Huez, you want to start early as they might close the hill if it gets too crowded. 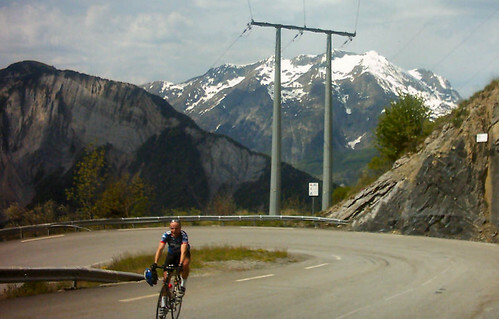 As an alternative plan to get to the finish line – see “Alpe d’Huez – Five Different Rides” for a map explaining a couple of alternate ways to climb up – via the Col de la Sarenne is a beautiful option. 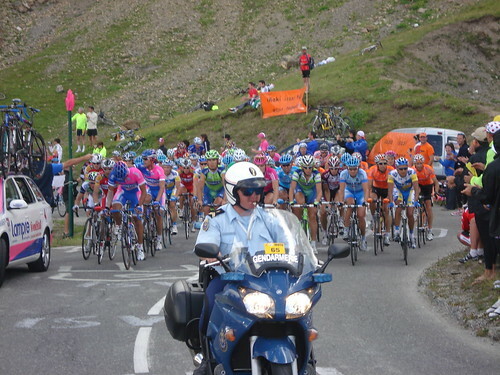 For this stage, i’ll be riding from Briancon and will probably watch atop Galibier. I’ll be the bald guy in the polka dot jersey, climbing at a measured pace. I’m not sure if you’ve ridden up the entire length of Alpe d’Huez, but give me an idea of the time it takes if you’re moving at average pace – 10 -13mph? 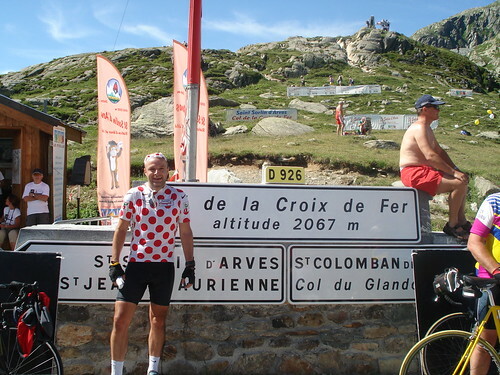 Pantani (1997) and Armstrong (2004) both climbed Alpe d’Huez in about 37 and a half minutes! Me? I’ve done it twice in about 1 hour 15 🙂 to the official, signed ending. 10mph would be about 57 minutes and 13 mph bout 43. It’s not the hardest climb in the Alps but it’s history and beauty somehow work to make it very special. 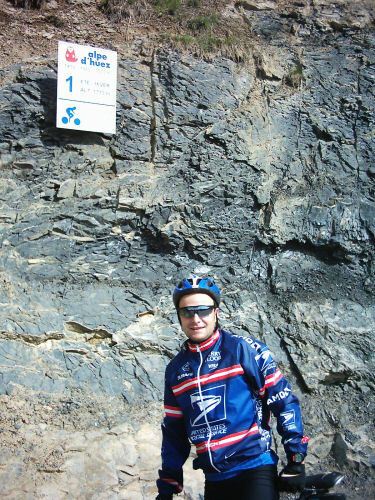 Way to go Will… You have been able to do what so many cyclists only dream of doing… and that’s just being able to say you’ve climbed Alpe d’Huez. This stage will be incredible to watch… and if the entire peloton is truly clean this year… it will be interesting to see who cracks first and when. Is there a best place (switchback number?) for viewing the riders on Alpe d’Huez? Without a car or bike, what is the best way to get to Alpe d’Huez? I’ll be staying in Grenoble the nights before and after stage 17. Much of it is one lane each way and traffic can be bad even without the Tour de France. Without a car or bike? Sorry not sure. There may be a train to Bourg d’Oisans? I don’t know if others have a favorite turn, but definitely the higher the better to see the finish – again, it will be packed, leave early and enjoy the day. Sounds like you have this sussed out pretty well. 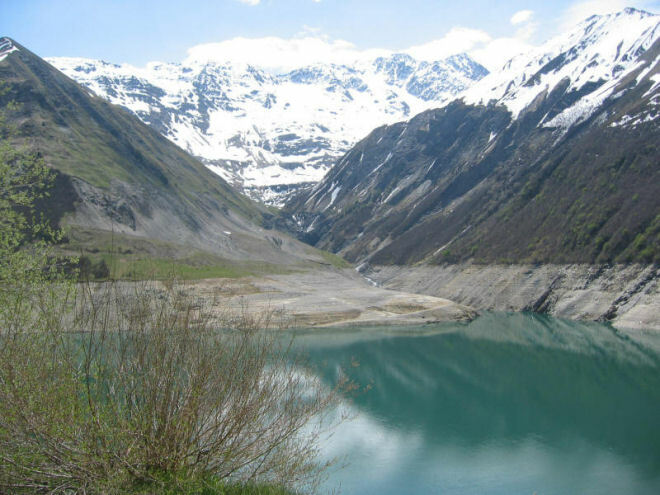 My gf and I have a place about 5kms south of Bourg d’Oisans for the week 20-27 July and plan to drive out to a few stages around Embrun, Jausiers, and Im pumped for the Alp de Huez stage. When you say “leave early”, what are we talking, being there mid morning (10:30am) to find a spot, or earlier based on your experience in the past? In general: If trying to climb, you want to aim to be at the top at least 2 hours before the Riders. Earlier is better. Alpe d’Huez is the end of this stage so you MAY be able to leave it to later, but Alpe d’Huez is sometimes a bit special because the crowds can be so huge. It would be worth asking advice the day before the stage from officials or police in the area. they may close the hill earlier – not sure. Remember watching a mountain stage is as much about riding as it is about waiting around and enjoying the festivities. This is going to be a fantastic stage. I’ll be riding most of the route (starting on the Col du Lautaret, finishing on Alpe d’Huez) just the day before. Thanks for the great info Will. I have just been over our maps and plans in detail and looks like we will make it to Alpe d’Huez in time for the tour stage. From reading above, it sounds like it would be ok to climb up Alp d’Huez in the morning and then await the Tour? I’m working in Montpellier, and just found out I’m able to take off next wensday to watch the alpe d’huez, but don’t know how to get there. The sncf doesn’t run there. any advice? Without a car? It’s about 55 kms from Grenoble and while not the greatest road, you could cycle from Grenoble.